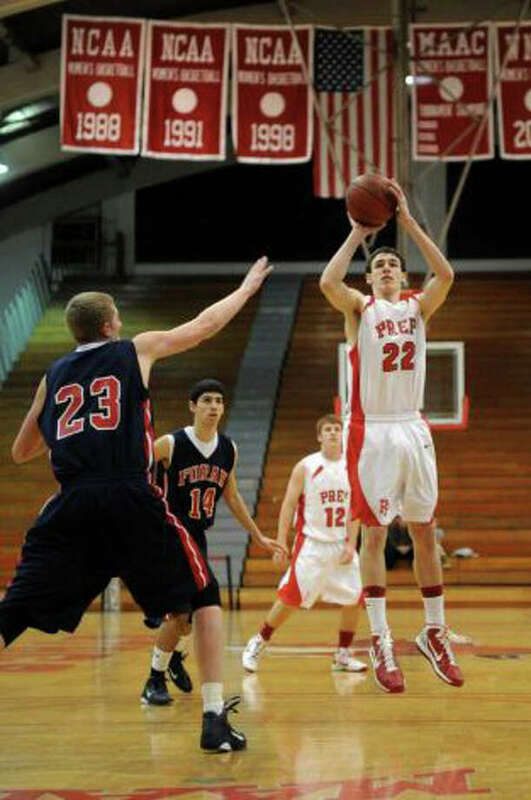 Fairfield Prep's Terry Tarpey will be the Jesuits' top-returner in 2011-12. Fairfield Prep head boys basketball coach Leo Redgate is confident he knows the formula for his team to get back to the Class LL state finals. The second-year Jesuits' coach whose inaugural campaign included a 21-7 season, a SCC semifinal berth and the Class LL runner-up, will have to motivate his club after losing four starters from that team. Fortunately for Redgate, his top scorer, Terry Tarpey, will return. The senior captain is bound for the College of William and Mary, but that still has not changed his perspective on the year. "He's a Division 1 player," Redgate said. "And he's still the hardest worker on the team." Redgate is also trying to foster an environment that creates more skilled players that continue to work hard, just as the Jesuits' captain does. "The message he sends is consistent," Redgate said of Tarpey. Along the same lines, if younger players show a stronger work ethic, they are going to see more playing time than the older, more experienced upperclassmen. "We need kids to step up and I don't care what the kids' ages are," Redgate said. "I need to play the hardest workers who are going to play my way." With Tarpey, Prep will line up junior guard and forward Tim Butula. Butula saw time a year ago, and will serve as one of Prep's top-shooters, but also a low-post threat with the Matt Daley's departure. Ben Sullivan and Mike Matera will be the Jesuits' guards, with Redgate still searching for players to round out the club's starting five. Redgate was abundantly clear about his aim of keeping Prep on the state's radar. He admitted the club might struggle in the early going as it adapts to varsity basketball. "We may take some lumps," he said. "But our program will be better." He also admitted he will relish a new-found bulls eye on his club's back. "It says a lot about our program," Redgate said. "I don't mind having a target on our backs...There's just a lot of responsibility that comes with that." But as long as his club is peaking and believing in itself as it enters the state tournament, he knows the club will be poised for another run at the state title. "Our goal is to have a team ready to go on a run in the state playoffs," Redgate said. "Our athletes need to believe they can win."